The Itaipu Dam is a hydroelectric (making electricity by the movement of water) dam on the Paraná River, on the border between Brazil and Paraguay. It is listed as one of the Seven Wonders of the Modern World. It is the world's second largest dam behind the Three Gorges Dam and is 7919 metres long and 196 metres high. It is the second-largest power plant in the world by nameplate capacity and the largest by power production in 2015-2016. 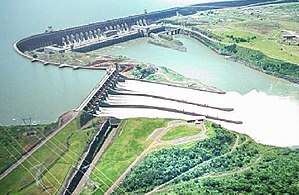 ↑ "Energy Deal With Brazil Gives Boost to Paraguay". New York Times. Retrieved 26 August 2015. This page was last changed on 14 April 2019, at 18:25.